Add the PFE Organization Calendar to your personal calendar app! Please stay tuned for updates as the season approaches. Updates are posted here, website, and Facebook. At all times, remember we are a guest to these fields. Please ensure all trash is picked up - even if it's not yours. Be respectful to any school officials. There is NO smoking on school grounds and NO packing on grass. Violations could lead to disciplinary actions for individuals as well as teams and ultimately the organization. We need everyone's assistance to maintain our great image. THANK YOU! Does your tackle football player have a state ID? Remember, SMYAC has implemented a government-issued ID for all tackle football players. Additional information can be found by clicking here. 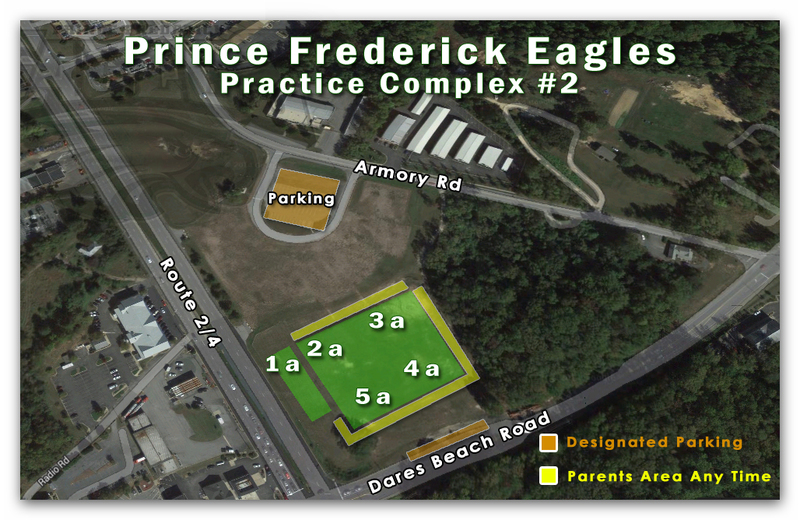 Our 1st practice of the Fall 2017 season is this Monday, July 31st at 6PM at PFE's Primary Practice Complex at Calvert Elementary/Calvert Country. There will be an organization address by the president starting promptly at 6PM. See attached map for org address and practice locations. The week 1 schedule is TBD, however below is the example schedule from 2016. More information will be posted and emailed just prior to season kickoff on July 31st. 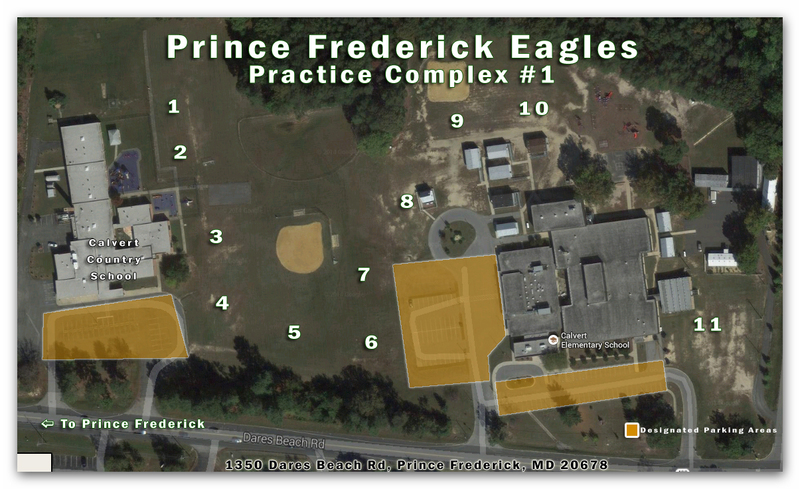 During the 1st week of practice, we will have a central location established (see attached map) to assist with practice jersey and integrated pant sales/online order pickups, information inquiries, registration and financial matters, and equipment repairs. A limited inventory of Eagles practice jerseys and black integrated pants will be available for $20 each. Online order of these items will be available for pickup at Eagle’s Flight Central. Equipment area with very limited supplies will be available before and after practice only. We will attempt to accommodate as many equipment items onsite, however additional efforts and interactions will likely require further arrangements at the HPP shed. Please ensure taking care of any known equipment items prior to practice days. Email Josh Dwyer at with questions, comments, concerns. Keeping our flag, tackle, and cheer athletes safe is our top priority. With this mindset along with the anticipated hot weather, we are immediately enacting preemptive measures for player safety to include no pads for tackle players first 2 days (tackle football participants will be receiving another email with additional details.) Additional measures may be enacted to include last minute cancelation of practices. Please keep your eyes open for potentially last minute changes from the organization and your specific sport. Such measures will be communicated via Eagles Facebook page (https://www.facebook.com/PrinceFrederickEagles/) and emails. Starting the day before practice, the young athlete should start hydrating by drinking plenty of water. Water is preferable, but if the athlete is resisting, use their favorite sports drink. Important: if they are thirsty, they are already dehydrated. After practice, sports drinks are preferable because they replenish electrolytes. Rehydration after practice is extremely important. It’s up to the parents to ensure their athletes begin the rehydration process immediately after practice. During the first weeks of practice, coaches are still learning several player’s behaviors and may not be able to identify a change as quickly as you. If you identify a potential medical concern, please notify coaches/org contacts within your area. Please nourish athletes before and after practice. Avoid dairy products, i.e. milk, prior to start of practice. The night before and 2 hours before exercise: focus on carbs, moderate protein, low-fat foods and fluids.